He began piano lessons at age five, and was said to show “remarkable gifts” though plagued by “abnormal sensitivity”. He was entered in the School of Jurisprudence at St. Petersburg when ten; and spent the next 13 years in non-musical study and as a civil servant; before deciding that his course in life would be music and took up studies at the St. Petersburg Conservatory under Anton Rubenstein. His music was slow to gain acceptance amongst both the conservative musical establishment and the nationalist group of composers (“the Five”) but his First Symphony found favour with the public, and the “Romeo and Juliet Fantasy Overture”, written (and reworked more than once) at the suggestion of Balakirev, was a success. 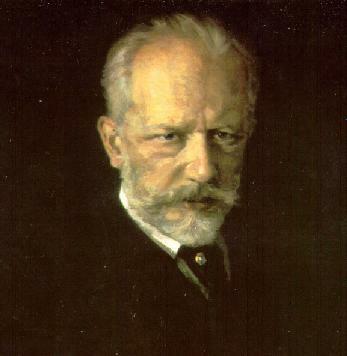 Tchaikovsky’s was the first music from a Russian composer to become popular outside Russia, and it has remained so to this day. His melodic line and orchestral drama overlaid with deep emotional expression can capture those who normally would not be interested in art music. Many of his more popular works are program pieces – the three great ballets, the “Romeo and Juliet” tone poem mentioned above, two of his operas, the “1812 Overture” – however his last three symphonies, the First Piano Concerto, and the Violin Concerto are all mainstays of the orchestral repertoire, and in the top handful of their respective genres. Six Symphonies – written throughout his creative life; the last, premiered nine days before his death, since called the “Pathetique” for its anguished last movement. Two completed Piano Concertos. Violin Concerto. “Variations on a Rococo Theme” for cello and orchestra is perhaps his most cheerful work. Other orchestral music includes the tone poems “Marche Slave”, “Francisca de Rimini”, “Manfred Symphony”, “1812” and the three Shakespeare fantasy pieces: “Romeo and Juliet”, “The Tempest” and “Hamlet”. “Capriccio Italienne” is a favourite. Of the operas “Eugene Onegin” and “Queen of Spades”are the two regularly performed. The ballets: “Swan Lake”, “The Sleeping Beauty” and “The Nutcracker”, whilst not always to his own liking, are all staples of the repertoire. A piano sonata, and other piano works; the most popular of which is the suite: “The Seasons”. Many songs, including “None but the Lonely Heart”; and some choral and liturgical works. His life was made miserable by his homosexual interests despite his beliefs against them. In 1877 he took the desperate step of marrying a besotted music student. The partnership lasted only 11 weeks. His despair found expression in the Fourth Symphony and “Eugene Onegin”. More satisfactory was his relationship with Nadezhda von Meck, a wealthy widow, who became his benefactor, and with whom he corresponded for many years. Her financial support allowed him the luxury of artistic freedom and her friendship – though, strangely, they never met – helped emotionally. In 1893, at the height of a cholera epidemic, he drank unboiled water and died within the week. There has been conjecture on the possibility of suicide. Certainly his last symphony was the work of a profoundly unhappy man, and had been programmed with its last movement entitled “death”. This page was last modified on 7 August 2017, at 12:28.